The African Region has witnessed signi­ficant improvements in population health outcomes over the past two decades. However, these gains still fall short of global and regional targets and are not uniform across or within countries. The Region is also faced with major demographic, economic, epidemiologic, and socio-cultural transitions as well as health security and environmental threats which place greater demands on health systems. In response to these, and to guide Member States in strengthening their health systems towards achieving universal health coverage and the sustainable development goals, the WHO Regional Office for Africa has developed a framework of actions which builds on various prior frameworks. 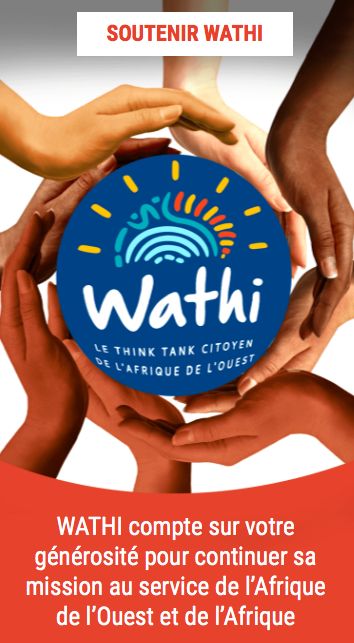 It is rooted in an integrated approach to systems strengthening, a focus on communities and districts, and appropriate sequencing of actions for the best possible outcomes. The framework calls for investments in seven health systems input areas, and facilitates more pro-active results monitoring through four output areas and six outcomes that measure the impact on wellbeing for all. The attainment of UHC, the overarching target that should facilitate achievement of all the other health targets in SDG 3, is directly concerned with the performance of the health system. A country is only able to provide the essential health and related services its people deserve if it has a functioning health system that can provide the services as and when needed. i) Foundational: The health system lacks basic foundations needed to support provision of essential services. Health system strengthening efforts are therefore focused on making available the foundations of the system for delivery of essential services. ii) Institutional: The health system has the basic foundations, but lacks the appropriate institutional structure and mix needed to maximise health outcomes. Health system strengthening efforts are focused on the organization and alignment of the institutional structures and functioning, to improve delivery of essential services. iii) Transformational: The health system has the basic foundations and institutional structures / mix. In this case, the health system strengthening efforts are focused on sustainability, exploring new ways of providing services that provide additional benefits, and supporting other countries whose systems are still in development. A health system requires a portfolio of investments in both hardware and software elements, to produce holistic system-wide performance and results. 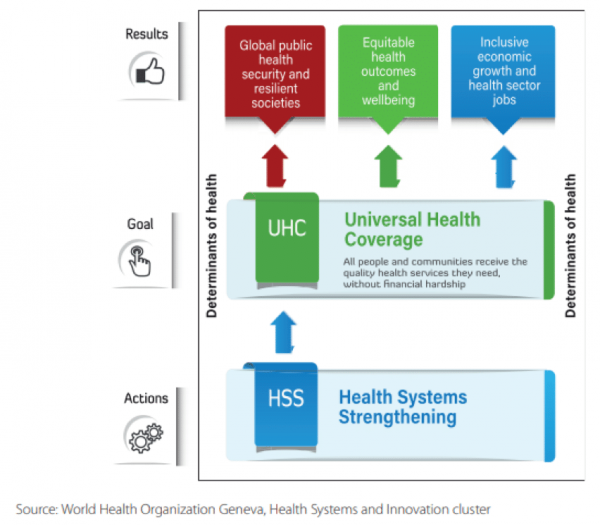 The following health systems investment areas, representing aspects of WHO building blocks, are fundamental action areas. The relative importance and gaps in each area will vary according to each country’s context and resources. This will determine what types and levels of investments are needed to get the best results from their health system. The monitoring of national health systems will utilize a common approach and index that reviews performance across these four result areas. As previously highlighted, health is cross cutting, with direct health actions reflected in SDG 3 and indirect health related actions across the other SDGs. As a result, the population outcomes relating to improved coverage of key services and interventions needed for improving health are reflected across the SDGs. Six areas for service coverage outcome elements are proposed. Area (1) Essential services availability: Presence of essential health services as defined by the country. Area (2) Essential services coverage: Population utilizing the available essential health interventions. Area (3) Financial risk protection: Population protected from financial hardships arising from utilizing essential services. Area (4) Client satisfaction: Population satisfied with essential services/responsiveness to needs. Area (5) Health security: Population protected from preventable outbreaks, disasters and other health emergencies. Area (6) Health interventions in other SDGs: Population utilizing key cross-sector essential interventions that improve health. SDG 3 – Healthy lives and wellbeing for all at all ages – is the overall health goal that countries in the African Region are committed to achieve by 2025. It represents the ultimate objective of all actions of the health and related sectors aimed at improving health. Achieving universal population coverage with key services and interventions across the six outcome areas should lead to the attainment of goal 3. Area (1) Life expectancy: Overall and disaggregated measure of expectation of life in the country. is can be through looking at the life expectancy (at birth, or at specific ages), and/or the healthy life expectancy (HALE) that discounts life expectancy for time spent unwell / with disease disabilities. Supporting HSS for UHC and the SDGs will require the engagement of a spectrum of stakeholders and actors within and outside the health sector. Ministries of health need to provide stewardship of this process. They should bring together stakeholders in the country, and coordinate the process of interrogation of actions guided by the revised planning and monitoring guidelines. External/international actors – Global Health Initiatives, multilateral institutions and agencies, bilateral cooperation agencies, (sub) regional institutions, private philanthropic foundations that fund, advise and facilitate actions on health development interventions. To achieve the key performance objectives, health system strengthening is best supported through a holistic approach. Projects that focus on specific health systems building blocks in isolation do not result in robust, resilient and responsive health services.